Most people value their privacy and kids are no exception. Whether we are talking about an adult or a child/teenager, there are some things we will share with one person or a select group and don't want other people to hear/read/see. Some people are private. It may not be anything bad, it's just the person doesn't want to share the information with the world. Or they don't want to have to explain that meme or hot topic. 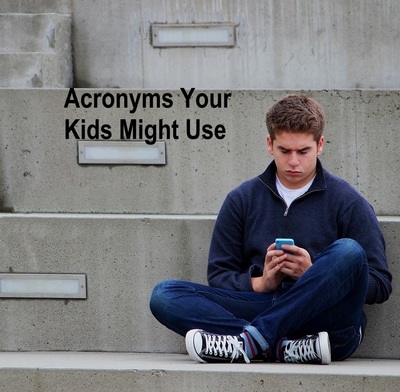 When kids are on the computer or texting they may use an acronym such as AITR to warn their mates there is an adult in the room. Their mates then understand why they aren't answering at the moment and know to be cautious what they write or say. Sometimes there is reason to be concerned when a youngster uses these acronyms to warn their friends of the proximity of an adult. Sometimes there isn't. Sometimes parents would probably find it useful to warn their peers of the presence of a child/teenager in the room. However, I am guessing the younger generation would be quick to break the code of something like CIR (Child In Room) or T911 (Teenager Alert). Young children often quickly work out what is being talked about when parents spell out words and I think acronyms could be similar. Would you like to live in an old style two storey house?